Crosman Elite Premier 0.12g BBs are perfect for fooling around in the backyard or shoeing away pesky squirrels. 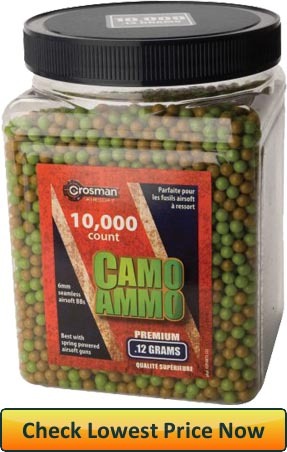 Not many beat Crosman’s price for a 10,000 count jug of 0.12g pellets. Their camo color blends incredibly well with the ground, making them practically impossible to notice when you’re relaxing on your patio. Their light weight and slight imperfections, both inherent to all 0.12g BBS, adversely affect their accuracy and range. This immediately disqualifies them for more competitive or heated airsoft play. However, if you’re looking to practice with guns that shoot less than 250 FPS – Crosman’s BBs will meet your needs efficiently and affordably. 3 Who are they for? 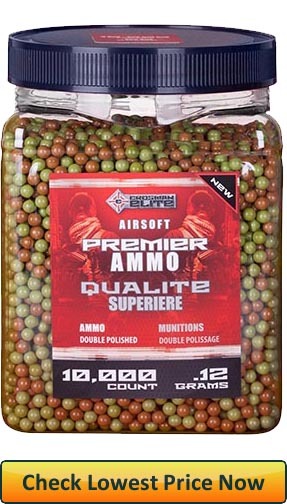 Crosman Elite Premier 0.12g BBs are camouflage colored beginner airsoft pellets. They are manufactured to be used in cheap and low power airsoft guns. All BBs are double polished to conceal and lessen the adverse effect of seams, created during manufacturing, over the pellet flight trajectory. The BBs come in a cheap plastic jug or several plastic bags, both prone to spilling out if dropped. They feed nicely and smoothly in most guns that would use them, though they should not be used in more expensive and high FPS guns. When buying 0.12g ammo, it’s probably not because you intend to go on a 3 day, 150 person, airsoft battle adventure. No, you’re probably purchasing them for leisurely fun or because you don’t want to waste your high quality 0.25g pellets on a cheap gun. Crosman’s 0.12g BBs will perform best on guns shooting at up to 250 FPS; 280 if we want to stretch it. Anything above and you should really look into buying heavier, more high quality ammunition. Usually, I try to match the quality of my BBs to the power and quality of my gun; You should too. While heavily dependent on your gun, the general rule of thumb mostly holds true: lower pellet weight = lower optimal range. This is not so much due to the correlation weight – range as much as the correlation between weight and gun power/quality. The range mostly depends on FPS and the flight trajectory. As we already established, 0.12g BBs are used exclusively with low power airsoft guns usually costing less than $100. These guns are usually of poorer quality and won’t ever effectively operate at long ranges. Add to this the tiny imperfections of Crosman BBs, affecting flight stability, and you get a lower range. For best performance, I would only use Crosman’s airsoft pellets at ranges of 60 feet and less. Not so much due to the BBs themselves, but due to the gun you’re likely shoot them with. Don’t expect these puppies to shoot exactly true. Their low weight makes it easy for weather conditions to adversely affect their flight trajectory. Gusts of wind will easily throw them off course. Seems and dimples, imperfect weight distribution, all often found in ammunition of this weight class, will affect the degree of accuracy as well. They may also curve when shot. Make sure the gun’s hop-up is adjusted accordingly, to compensate. Also sold under the label “Camo Ammo” seen here. This is the exact same product. The dark brown and beige/dark green colors, akin to military camo uniforms, are a double edged swords – depending on your preference. If you have a big yard and don’t mind the occasional pellet under your feet, Crosman BBs do a great job of blending into their surroundings and disappearing into them. A huge advantage over neon, yellow, white or other bright colored BBs which are often a strain on the eyes and can easily ruin a well maintained backyard. On the other hand, if you’d like to protect your immediate environment, these plastic balls are a pain in the neck to dispose of. Their camouflage colors makes them incredibly (!) difficult to collect. Trying to pick up a few hundred or even thousand of them is a futile endeavor. Fortunately, Crosman has a solution for this. They have created the very same 0.12g pellets, but biodegradable. Always remember, BBs are never to be reused! Collect them to be thrown out, not to be reused! If you’re unaware of biodegradability, make sure to check out that section in my Ultimate Airsoft Guide. As mentioned above, these specific BBs are not biodegradable. Meaning they will remain in your yard for hundreds of years if not collected. This quickly becomes a problem if you’re planning on using them regularly. Yards full of little plastic balls are no fun. To combat this issue, Crosman have created identical 0.12g pellets but biodegradable. Check them out yourself by clicking here. Buying biodegradable BBs is always worth the satisfaction of knowing you’re protecting your environment. An inherent quality of 0.12g ammo is their lack of durability. This another reasons why I always strongly recommend using o.12g BBs exclusively in cheaper guns. You really don’t want to break a $300 airsoft gun because of cheap ammunition. Crosman BBs were a surprise in that department. While they are far from perfect, they have never been broken by my loading nozzle. However, there is no doubt in my mind that they will shatter into a thousand pieces if they are used on more expensive and more powerful airsoft guns exceeding 300 FPS. Stick with guns shooting at less than 250/280 FPS and you should have no problems. One thing to note: 10,000 airsoft pellets are heavy and the packaging WILL burst if dropped. What I usually do is pour them into an empty 5lb protein powder tub, which come with sturdy lids and are made of thick plastic. Try to find a different bag or bucket to transfer them into and you should be good to go. When it comes to seams, Crosman’s 0.12g BBs have those. The “dual polish” is done specifically to remove the seam lip. While it does so splendidly, it doesn’t remove the seam – which is the weakest part of a pellet and usually where it would break. And while seams are the end of the world, they do compromise the structural security of the BB which in turn increases the risk of it breaking. Something, I’d like to note, has never happened with my batch. No perfect spherical BBs exist, but the closer to a perfect sphere they are – the better they fly and behave. Crosman have done a good job at producing consistently spherical BBs. Of course, black sheep and frankenstein pellets do exist in every batch, but the vast majority are surprisingly well manufactured. When it comes to price, Crosman BBs are priced competetively and I would consider them to be affordable. Would I love a bit of a cheaper price for such a huge amount of 0.12g BBs? Yes, I would. At the end of the day, I’m happy to pay it if the product is good and in this case I believe it is. Crosmans Elite Premier 0.12g BBs are some of the best 0.12g airsoft BBs for the vast majority of low powered guns and casual airsoft players. Perfect for shorter range backyard play and joshing around with a few buddies. Affordable and surprisingly durable. If you have used these BBs and would like to share your opinion or you have any questions or concerns, make sure to comment below and I’ll get back to you!